It seems as I get older, all of my favorite foods are on getting placed on the no fly list. Carbohydrates are now the enemy so those 9 million sandwiches that I have already eaten over my lifetime, they were delicious but no good for my waistline. Pasta is bad, pizza is bad. But I guess living past 60 years old is good too so I’m all in on this low carb diet. 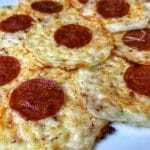 And my low carb pizza crisps recipe makes it a little easier to go without pizza. I’m still going to eat some of these high carb foods on special occasions but it’s the daily snacks that are the problem. If you eat a high carb food several times a week, you’re asking for trouble. So these low carb pizza crisps are a great snack or lunch that makes the day to day carb cutting a lot easier. They’re really easy to make too and can be ready in under 10 minutes. Place a piece of parchment paper on a cookie sheet. Depending on the size of your cookie sheet, you’re going to make 4-6 piles of cheese. These piles are going to melt into 3 inch circles of gooey and crispy cheese. Start with the shredded mozzarella cheese, then add little grated Parmesan cheese. You don’t have to be exact with the proportions but keep your mozzarella to Parmesan ratio somewhere around 3:1. Then sprinkle a little garlic powder on each pile. Next up is another sprinkle, this time with oregano. The oregano gives these pizza crisps and a distinct pizza flavor. 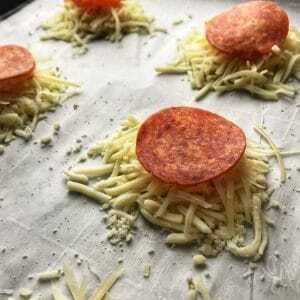 Then each little cheese pile should be topped with a slice of pepperoni. Pre-heat the oven to 375 degrees Fahrenheit (190 Celsius). You want to melt the cheese but you also want the edges to be browned and crisp. Cook for seven minutes and then remove from oven and let them cool. Don’t try to eat them right away because piping hot cheese on your tongue is never a fun time. What’s good about using the parchment paper is that you can slide the paper and pizza crisps right off of your cookie sheet and they’ll cool a lot quicker. 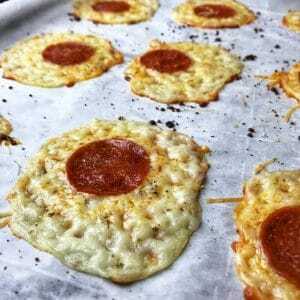 After a few minutes your low carb pizza crisps will have cooled and hardened a little bit. You want to serve them cool enough to pick up in your hands but still warm enough so they bend a bit. You can also serve them cold too. Oh and you’ll definitively need a lot of napkins because just like regular pizza these crisps are going to be greasy. A variation of this recipe can be made with a slice of salami instead of pepperoni. It won’t really taste like pizza anymore but it’s still really good. And then adding some pickled banana peppers will give it a hot Italian Combo Hero taste. Yum! I like to serve the low carb pizza crisps with a little bowl of tomato sauce for dipping. Here’s my tomato sauce recipe. It’s always good to make extra tomato sauce and freeze it so that you always have some on hand. So there you go. You’ve got the cheese, the spices, the sauce and the pepperoni from the pizza. What you don’t have is the crust and the carbs. Hey it’s a new world of food and I can get by with great tasting snacks like this. Pizza is definitely not on the low carb diet. But these Pizza Crisps will satisfy your pizza cravings and make it easier to go without. The pizza crisps should be browned and crispy at the edges but still cheesy toward the center. Is it possible to make this in an air fryer? It might be tricky to cook these with an air fryer. The grated cheese will probably fall through the holes in the fryer or melt through it making it very hard to get them out. And if you use parchment paper it’ll probably work but make sure you don’t cover up all the holes in the air fryer basket. Remember the air fryer works by circulating hot air so if the basket holes are blocked with parchment paper it’s not going to work as well as it’s supposed to. But since your not cooking raw meat and just trying to melt some cheese I say go for it. Give it a try and let me know how it works out.